Patrick Brimstein was brought in as superintendent in May 2017, with the aim of righting the 3,200-student system's finances. The school board took the action at a special meeting Monday night. 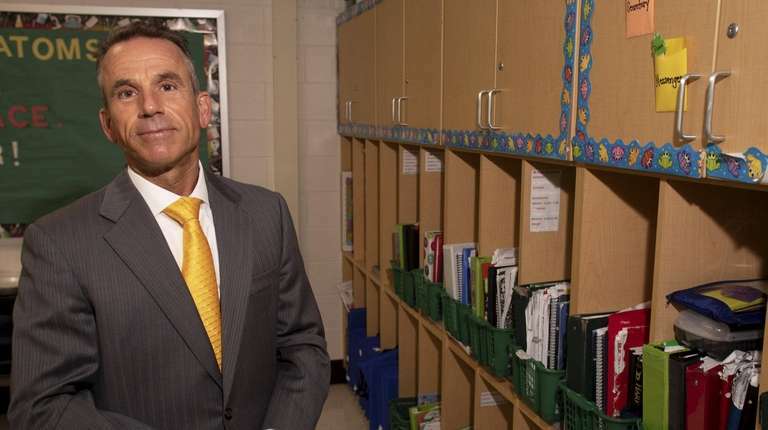 Eastport-South Manor schools Superintendent Patrick Brimstein, brought into the district in May 2017 as a financial troubleshooter, was placed on paid administrative leave by the district's board Monday evening, local officials confirmed Tuesday. Nicholas Vero, the board president, declined Tuesday to discuss the reasons for Brimstein's indefinite suspension from his $224,700-a-year post, citing confidentiality rules. The administrative shakeup came less than two days before a crucial vote by the seven-member school board on whether to submit a $97 million-plus budget to voters on May 21. As planned, the budget for 2019-20 would be accompanied by a $512,411 ballot proposition to hire armed security guards, which would push Eastport-South Manor over its state-assigned tax cap. Vero said that daily operating decisions in the 3,200-student district will be made temporarily by two assistant superintendents — Tim Laube, who is in charge of business and school operations, and Linda Weiss, who handles personnel and district accountability. "We just need time to catch our breath," said Vero, who acknowledged that the latest management changes are upsetting in a district that has spent more than a year struggling to get its finances in order. Vero added that board trustees probably would meet sometime next week in order to start the process of hiring an interim superintendent. Laube and other district staffers voiced confidence that the Eastport-South Manor system will move ahead with budget plans that have undergone months of public hearings and planning. The school board is scheduled to meet in a private executive session Wednesday evening, then hold a public session starting at 7 p.m. at Eastport-South Manor Junior-Senior High School to make a final decision on its proposed budget. “I’m confident that the board has been diligent in coming up with the best budget possible for the children and community, “ said Linda Wygonik, president of the district’s 345-member teacher union. The budget under consideration for the 2019-20 school year would boost Eastport-South Manor’s spending by 3.81 percent and raise tax revenues 3.69 percent, Laube said. The projected increases would exceed the district’s tax cap and require approval by a 60 percent “supermajority” of voters on May 21. In January 2018, Eastport-South Manor was identified by the state comptroller’s office as among 26 districts statewide facing fiscal stress. A drop in the district’s cash reserves led to a downgrade in its credit rating from Standard & Poor’s. At the time, school administrators said the district’s fiscal woes had been building for years, as staff levels continued to climb even as enrollments fell. In addition, administrators said, the district repeatedly dug into cash reserves in order to curb taxes. Brimstein himself said repeatedly that Eastport-South Manor had been “living beyond its budget for years.” He did not return a Newsday phone call Tuesday. Eastport-South Manor considered trying for a tax-cap override in the May 2018 balloting, but then dropped the idea. This year, it is one of only two districts on Long Island planning override attempts. The Wyandanch system, where the fiscal crunch could mean a proposed budget with a tax hike of more than 40 percent, is the other.